Sitting on the floor, holding my head in a grieving pose, I touch into the deep grief I have just released in tears and tears last weekend. I know this pose. I always knew how to cry, a use-full outlet of emotions after episodes with my often angry, hurt and hurtful mother, in my childhood and beyond. Now, I can feel into the presence of my Gestare friends, doing this MA grief pose in their various time zones and places. I feel them closely, their strength and love, how we are a circle of grievers, the women wailing. In this sense of accompaniment with others, I fall into knowing how its grief that has been working through me these past years. A trail of grief in my research, seeking to restore the lost female/feminine and MA herself, the death of my grandma, facing my mother, and learning to hold gentle self-compassion - like Luisah Teish's title, "Still crazy after all these tears." The work of justice is grief work, and loving the world anyway with joy, gratitude, and blessing. Grief can go on, its not that I am in it every moment, but I know this feeling of absolute desolation in the full-wailing of tears. To feel fully, and to be alive in the feeling of it. And the vulnerable, raw ache in my stomach grief leaves behind, a soft, open feeling. I am humble before life. Deeply grounding I sit in comfort illuminated by the full moon shining through my window in the small hours of this night. Grieving, grief, the dark underground watery flow of tears awaiting the opening of the channel for the shedding. Finding the pose with hand upheld as if a mirror to the face of my own grief, I notice the movement deep in my belly, the movement that signals tears in readiness. From belly through heart to the welling place my lower eyelids slowly filling. Wavering on the edge of flow for a moment I notice my own willingness to allow the welling up of all the grief. My own knowing that this edge is a relief valve that when opened allows the gushing to pour forth. Remembering that the gushing makes way for the deep calm that follows. I am reminded of the time I first became aware that some of the grief flowing through me was not mine, it was my grandmother’s. I notice my shoulders tense up and my chest tighten. I soften my heart and deepen my breath gently in response, for this is not my grief, this is indeed the grief my grandmother passed along to my mother, I only need to open the channel for it to flow, I do not need to continue carrying it. 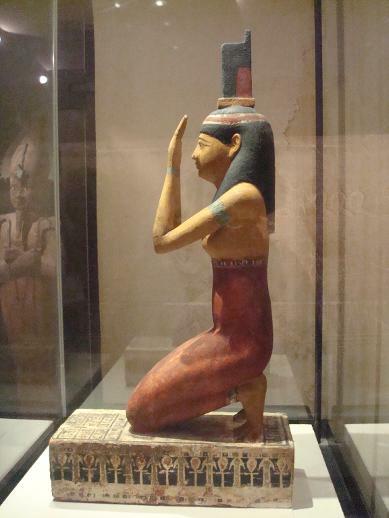 Holding this pose of the ancient goddess Isis in mourning, I sense the presence of that intergenerational grief carrying along the matriarchal line far beyond my own blood ancestors. My awareness shifts to my own grief, which of late has been taking the form of grieving losses of relationships, health, potential, opportunity, hope, belief, occurring in my own lifetime. These losses have been presenting themselves to me in these later years of my life with a request for healing through the watery flow of tears. Allowing myself to cry for these lost dreams, soothes the sharp edges of their memory and lightens the weight of their load. Comforted somehow by the awareness that in this pose I, daughter of MA, am a link in the continuum of women’s grieving honoured in this practice, I open to the awe, gratitude and humility in me in response to this pose breathe into my grounding and welcome myself back. Women's work of mourning. Art as a work of mourning. Kneeling in front of Megan's window with the full moon in the sky. Striated clouds surround the moon. I bring my hands up in front of my face and realize I am blocking the moon light from my view. I immediately begin to yawn. Open full-mouth yawns that create the build up of fluid in my nasal cavity and eyes. I can't stop these huge yawns. Blocked from the light of the moon-- separated from it. Deep releasing takes place through my yawns in this state of separation. My hands become tense and my body begins to quiver intensely. It is difficult to stay upright. I have a strong desire to collapse myself to the ground. It is so difficult to stay upright doing this work of mourning. I am feeling the significance of this difficult work. When the 7 minutes are up I let myself collapse forward onto the floor with great relief. This morning I make myself comfortable in my sofa chair for this pose of grief. I begin to wail softly thinking of the mourning work of women. I do not feel personal grief. I am aware in this pose that the one eye is unobstructed while the other is protected. The inward and outward in balance. As I sit in the pose I bring to mind personal grief as well as the grief of others I have wit(h)nessed. I feel I could stay in this pose a long time. It is a familiar pose, but not one I need to be in for myself at this time. Barbara has come over to my house this evening for the pose. We open my front window curtains and face the full moon in the dark of our poses. my hands raised in front of my face. as though it is in the sky. but I can not cry in this moment. holding his mother in my arms. I have to be strong for her. My heart is strong as a stone. May I feel the reflections and keep the warmth of the sun Shine.